The week before Christmas is always a joyous time. A time to give thanks and enjoy the fruits of your labor. A time to drink, eat, and be merry. 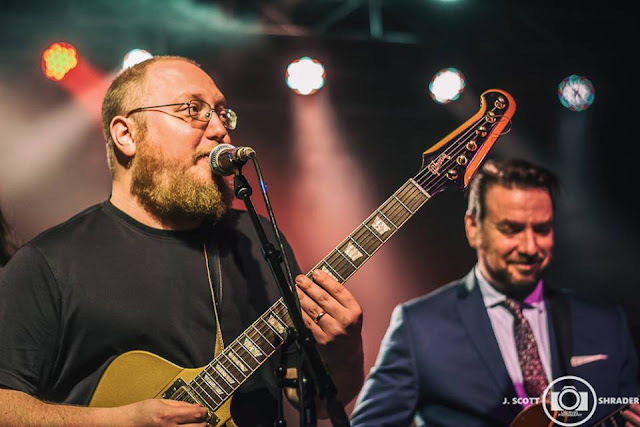 Saturday night was no different, as The New Mastersounds and Turkuaz, ended their fall tour at the Orange Peel in Asheville, NC. The night started with Turkuaz, a 9 piece "Powerfunk" outfit hailing from Brooklyn, NY. Turkuaz sounds like the Talking Heads and Rick James had a musical child, minus the glitter and over sized suits. Their songs boast strong melodies and catchy choruses. Their live show features strong vocal performances, killer horn solos,incredible guitar work, and a hyped up bass player that would make Bootsy Collins proud. Overall Turkuaz puts on a great live performance with plenty of energy to keep the party going. The New Mastersounds took the stage shortly after Turkuaz starting with a song off of Therapy titled "Monday Meters." The band would then take the crowd on a journey through their catalog, touching on tracks from Made For Pleasure, Out From The Faultline, Ten Years On, and more. The New Mastersounds are known for their new age jazzfunk dance party, and were not to shy to keep their reputation alive and well. The set included a barrage of sit-ins from varying members of Turkuaz, which was a welcomed surprise. The Turkuaz horn section came out about midway through the set to join The New Mastersounds on a killer version of Billy Preston's "Will It Run Round In Circles." The horn section was prevalent for most of the set after that, touching on classic NMS tunes. The encore would include two songs that NMS and Turkuaz wrote together. The song "On The Border" sounds like classic Parliament Funk, boasting a beautiful vocal chorus and infectious groove, true funk at it's finest. Look for these two bands to do a lot of work with each other in the future. Their stylings are so well matched, that it seems that destiny or fate brought them together to forge the path of a new funk revolution.